Very few moments mark a man's life as when he falls in live with his new hometown. 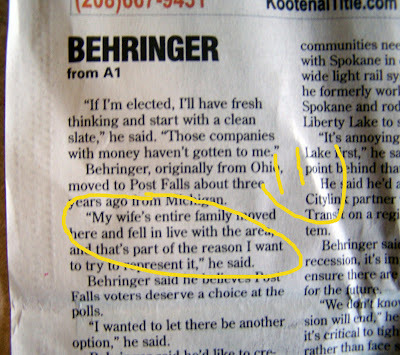 I'm glad the Coeur d'Alene Press shared this story with us all today. How do North Idahoans and Eastern Washingtonians stay svelte? By experiencing the occasional Thinderstorm! 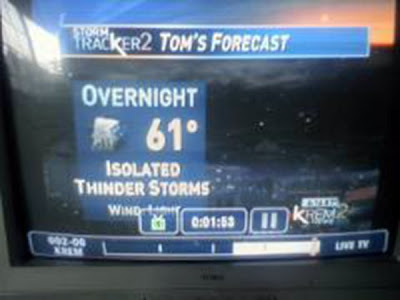 KREM 2 weatherman, Tom Sherry, has been on the lookout for the rare occurrence which reared its fat-free head last week. Some, like me, chose to ride out the Thinderstorms from the safety of our kitchens with well stocked refrigerators and pantries. Others prefer to revel outside, allowing the Thinder to rain artificial sugars and non-fat ice-cream on their already perfect frames. I bow to you again, Megan! 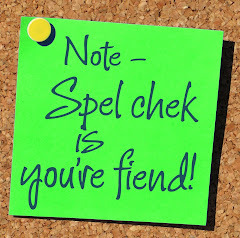 No Spelling Disaster can escape your reach! I have read and reread this sentence from the September/October 2007 Taste of Home's Simple & Delicious magazine. 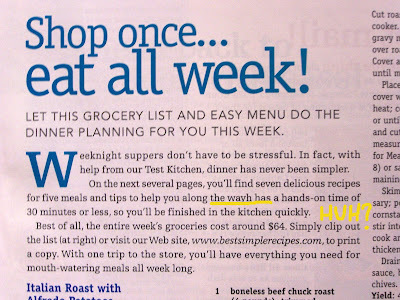 Along the wayh has a wonder why a large, national magazine would miss a mistake like this. The editing was probably done right before lunch time when the photos of yummy food drew the eye away from the words.